While people that carry checkbooks is on the decline, the fact is they still serve a good purpose, and can be beneficial to business, and customers alike. Also, a lot of businesses still prefer paying with a check. Check services for accepting payments, or e-checks is fast, easy, and in some cases safer than accepting a card payment. With check processing, you can skip writing deposit slips, or worry about checks being stolen or lost. You deposit checks instantly instead of going to the bank every few days, or weekly. Customers no longer have to mail a check leaving them vulnerable to having their banking information pass through several hands, and you no longer have to wait for payment. You can process the check at your business, through a website, or even take a payment over the phone. Processing checks is cheaper than processing most credit cards. You have several options when you set up for processing check payments. 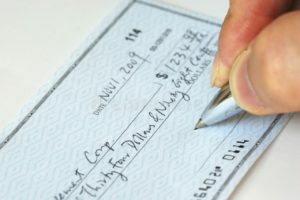 When processing a check, the check gets verified on a secure database helping to assure you of being funded, or depending on your needs you can also set up to get guaranteed funding. Processing check payments helps eliminate charge-backs, speeds up funding at your bank, helps avoid taking insufficient checks, and as I mentioned above, you can even skip having to go to the bank altogether. Check processing can be very beneficial to your business, and your customers. Setting up to ACH checks, or transfer funds directly from your customer’s bank to your bank is probably the lowest cost way of accepting any form of payment. When setting up to ACH transactions, you no longer have to physically handle or keep up with paper checks, customers can make a one-time payment, or set up for automatic recurring payments if they’re a a regular customer, or member to your business, you can even allow them to pay off a product or service in monthly installments. Making it easy for your customers to make payments face to face, over the phone, or through your website will increase your bottom line. Most customers prefer ACH payments over writing checks, and/or mailing checks, and if they set up for recurring ACH, they no longer have to remember to make a payment each month. Contact us , either through phone or email or click get a quote on one of our many services. Start saving today!